Running Time: 1hr 12 min. The command «Come» is one of the most important commands. You cannot control your dog without it, because your dog, not knowing this command, will not run to you. This disk includes different methods of training your dog, considering both its individual qualities and age. The command “Heel” is one of the most important commands that we use while walking or running with a dog. The dog moves together with its owner and matches his movements, not interfering with his turns. Once your dog learns the command “Heel“, you can take it anywhere, and walking with your dog will be a lot of fun and a pleasure. The command “Place” is one of the commands you cannot manage without in everyday life. This command is also used to ask a dog to protect his owner’s things while he steps away. The dog must return to its place immediately upon the command “Place”, and not leave it without its owner’s permission. 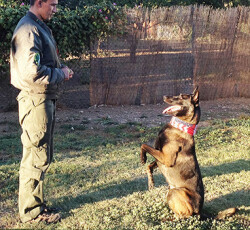 The command “Aport” teaches a dog how to bring objects of various size and weight, which develops the dog intellectually and allows you to use the command in various spheres of life. For example, a dog can assist its owner (a service dog). Another example is searching and selecting the owner’s things from others, which is often used by the police and military. 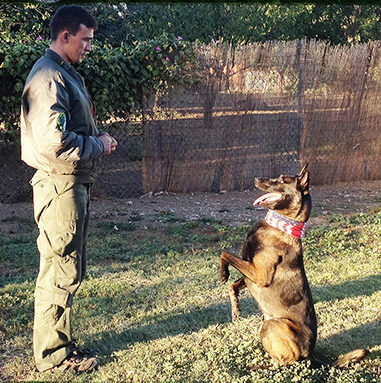 All of these commands are demonstrated in different training methods, depending on the age and individual qualities of the dog.